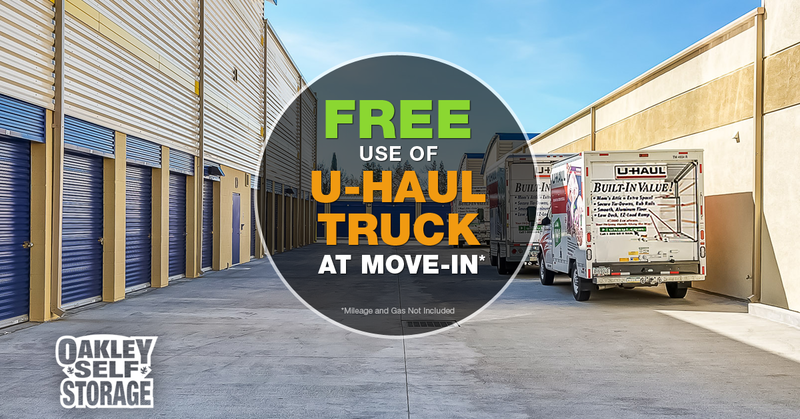 At Oakley Self Storage, we understand there's a lot that goes into moving, which is why we offer free U-Haul moving truck rentals to our new tenants. By taking advantage of this special offer, you don’t have to borrow a friend's truck, or spend time searching online for the best deal. Allow us to help make your moving day a fun, stress-free event, with one less thing you have to worry about. Some restrictions apply, and keep in mind this offer is only available to tenants who are moving their possessions into a new storage unit rental at Oakley Self Storage. This gesture is a way for us to say thank you to our customers, while staying true to our mission, offering the highest level of customer service in East Contra Costa County. For offer details, please call our storage experts at (925) 625-7867 to schedule a truck rental upon move-in to your storage unit. Extremely friendly Jess and Dylan! The facility is super clean and secure and I am very pleased with my experience. I love the convenience of having packing supplies at the site! You can see they take great pride in their facility. Highly recommend. Thank you!